Have really been enjoying your blog entries--so well written (well, of course). Unfortunately, I couldn't get the link to work for the "engaging website" you mentioned. At any rate, so glad I discovered your excellent blog through Twitter this week. It's a joy to read! Thanks much, Ashley. For the read and kind words. And for heads up about the lame link, I'll fix in the post. It does jerk your brain a little. "Man arrested for driving car 40 miles per hour." Does too. Lovely post, Ms. Broad! I remember looking back through old papers--I'm talking the 30s and 40s--and being mesmerized by how intelligent and poetic it all sounded. We were at a restaurant in Little India here the other week, and picked up a community paper. The English articles were written in such lovely, rich language--almost like a long-lost version of English. It was beautiful to read. Wish I'd picked up the NYT that day. That's an interesting point you raise, about the poetry on the frontpage. Long live Bukowski! @R2K @Abe lincoln @SP @grodrigues @halı yıkama @jascef422 Thanks! I really like the Hemingway story by Hotchner. It would be very cool, the way the Ritz Hotel campaign was, referencing many of the old and current "glamour queens" who stay(ed) there, e.g. Ava, Marlena, etc. I have seen the ongoing Vuitton campaign in Vanity Fair so I checked out the video but it's tooo long for my attention span. What do you think of those people who say man never landed on the moon? @California Girl I agree the Vuitton video needs editing. Good concept, though. 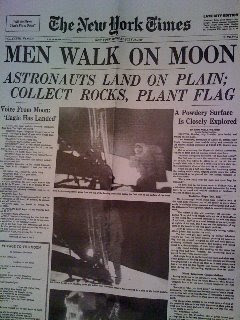 @Kimberlee Funny, the day I posted this my doorman tried to engage me in a long conversation about how the moon landing never happened, was a media conspiracy. I grant that it's possible. But I think that by now any Moongate cover would have been broken.